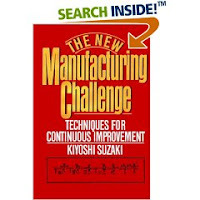 The New Manufacturing Challenge by Kiyoshi Suzaki, published in 1987, is the first book about lean that I read. It gave me an introduction to continuous improvement in manufacturing, with an emphasis on the shop floor, that has served me well for almost 20 years. The book works for the beginner, with a minimum of jargon or Japanese terminology. It encompasses all the basic techniques of what we now call lean manufacturing with an action-oriented approach. There is nothing new in the book, as Suzaki himself notes in his introduction. The book’s simplicity is an advantage. And although the numerous examples drawn from many companies around the world date from the 1980s, they still convey new ideas. Kio works his way through the lean toolbox, showing how the tools are used and how they fit together. The language and examples are simple, and accessible to anyone willing to take the time to read it. The book is notable for Suzaki’s use of visual representations of the concepts he means to convey. Not everyone learns well from written text, and not everyone reading a written text takes the time to fully concentrate on what it is saying. Suzaki’s stick people effectively show how work can be improved. He also uses simple graphics to illustrate concepts such as the difference between batch and mixed model production. Reading the book almost 20 years after the first time I read it is interesting. Subtleties that took me many years to discover and absorb are right there. I couldn’t have fully understood them then. The book holds up over time and reflects the depth of lean principles. Like any broad introduction, the book can give an explanation and a few illustrations and ideas on a range of subjects, but cannot go much further. Also, the beginning reader won’t find the standard Japanese lexicon, and may struggle a bit to connect terms he or she has heard with the concepts in the book. The age of the examples means that some companies may no longer be performing well, or may even have gone out of business. That shouldn’t affect the credibility of the book, however. Sustaining lean gains is notoriously difficult. Another good thing about the age of the book is that you can pick it up used from Amazon or ABE books for about $1. The book is simple enough to read straight through, but the reader should go back and spend more time with the illustrations and diagrams. Rereading sections periodically would be a good idea as well – especially if you read it some years ago. You could also skip around instead of reading chapters sequentially – it’s pretty modular. If you want to use the book as a training tool, there are a couple of options. One is the reading group approach. Taking a chapter a week, all the members of the group are charged with reading it, and the group discusses it together. Individual members of the group might take turns leading discussion in successive weeks. The video includes factory footage and interview-style discussion of the topics. I can't remember where the blonde interviewer with the short skirt came from, but she knew how to read a script and might help hold the attention of male viewers. It runs a little over three hours and comes with an instructor’s guide and workbooks. The price is about $1,000. There’s a preview tape for a nominal charge. You'll see Kio proudly brandish the toilet brush the workers in one plant awarded him for his obsession with cleanliness. And if no one in the room gets misty-eyed when a guy stands in front of a building describing how it used to be a factory, but now houses a shopping mall, they don’t really care about saving your company from the same fate. The New Manufacturing Challenge is well worth adding to your lean bookshelf – but be sure to read it first. Suzaki’s credentials are solid. He was educated at an elite university in Japan, and earned an MBA at Stanford. His consulting practice and knowledge were developed on the shop floor in Japan, as well as in American companies, large and small. Clients gave him high marks for the help he gave them. Suzaki doesn’t pop up in the usual lean buzz very often, but he has written several books since, getting deeper into the “heart” of lean and the importance of people. I just noticed your kind remark. Since the NMC book, and New shop floor management, results from the heart, etc, I am into Artificial Intelligence, also tying with mini company concept I shared in NSFM book. I posted few youtube videos recently and may do more. It is certainly an interesting field/subject - much more than just in the business and management aspect. Anyway, I may try to write more books - or at least one more - being encouraged to your comment. Yes, simple and fundamental... application is many - also and especially important is to practice in our life! Best wishes, and .. may all beings be happy!